Tokyo, 1958. A man seriously gambles at a mahjong parlor. He's playing against members of the Ryuzaki yakuza clan. If he loses, he must pay his debt through his own life insurance – truly a game of life and death. With his own existence at stake, he can only play passively, and the game comes to a head. Suddenly, a mysterious boy appears. His name is Akagi, a thirteen-year-old kid. The man senses a strong aura around the youth and decides to have Akagi substitute for him in the next round. 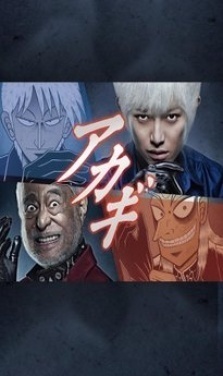 -- Synopsis This live action adaption center the battle between AKAGI and Iwao Washizu in which the game "Washizu Mahjong" is play, The mahjong tiles are mostly made out of glass tiles replace and make the game different in many ways compare that to of an regular match.